UKSaabs • View topic - 92 9000T DI/APC. Ignition cut removal. How ?. 92 9000T DI/APC. Ignition cut removal. How ?. Post subject: 92 9000T DI/APC. Ignition cut removal. How ?. So my lads 92 9000 which is Bosch LH & Saab DI/APC. Now has a TD04-15T at its heart. We have the Red box DI/APC which is rated at 204bhp, but the APC valve is long seized. So we have a bleed valve on it set to 1 bar peak. Now, if i try to wind it up anymore, say 1.1 bar. It cuts out. If i put the original Black DI/APC back in (150bhp), then it cuts out at 0.6 bar. So to me it seems as if the Boost cut is in the ECU somehow. (Programmed). So how to get rid of this. I have the same issue in that i cannot see how on earth the ECU is determining boost pressure. Since there is no sensor. There are no pipes going to the bulkhead. So nothing goes into the interior like the old APC's that had a pressure transducer behind the glovebox. So what is this sourcery that DI/APC is using to determine pressure ?. And can i get rid of it ?. I used to think i was good on this early stuff, but this just has me stumped. Last edited by Paul Taylor on Sun Sep 16, 2018 2:23 pm, edited 1 time in total. Post subject: Re: 92 9000T DI/APC. Fuel cut removal. How ?. Is there not an airflow meter and a temp sensor in the delivery pipe? So what is this sourcery that DI/APC is using to determine pressure ? A MAP sensor. It just doesn't look like the Trionic MAP sensor. Anyway, you can't get rid of it, I would think. If you can determine which location in the ROM contains the boost limit value then you can programme a new ROM with a modified value. You'd probably have to reprogramme the checksum with a new value too. I know that's what Abbott used to do on Trionic after fitting a bleed-valve or uprated actuator (ugh!) and I'd be very surprised if they didn't do the same with DI/APC. You may be right on a 1992 model but if it did have one then you wouldn't see it in that photo. On DI/APC cars I think it was mounted under the dash. Anyway, the point is that no matter how it measures boost pressure, if you want to modify the boost limit I can't see any safe way of doing it other than modifying the boost limit in the ECU. Any way of trying to fool the ECU into thinking boost is less than it really is will cause it to run lean and that is dangerous. As I say, the hard bit is finding out which locations to modify. Once you've done that I assume you have access to an EPROM programmer to carry out the modification? The other way to do it, and the way I would tackle it, to be honest, would be to fit a working BPC valve. I detest bleed valves and the bodgery they represent, as well as the absolute reliance on high-octane fuel. I think Paul wants to run at higher boost, whether using a bleed valve or otherwise, either way the fuel cut issue comes up with higher boost. I think I have the Abbott (or another) special DI/APC box, with higher fuel cut. When mine is finally running (with TT hybrid) i'll be seeing if I hit fuel cut, if not you are welcome to investigate the ECU. Might one day get around to the 234 conversion. Surely fitting the Carlsson ECU was supposed to give higher boost but without the BPC valve it is no better than running the original, other than that fuel-cut occurs at a higher boost pressure - but it still occurs. Yes with the Carlsson ECU there is higher boost. The standard black 150bhp ECU gives 0.5 bar. And the Carlsson ECU gives 0.9 bar with a bit more aggressive ignition as well. We were running the APC valve, but it kept sticking. We got fed up with that in the end hence a bleed valve now fixed at 1 bar. Now, given we have tweaked this car a bit. It has a TD04-15T. It has the 3 bar fuel regulator. Abbott downpipe and full system. 3" intake, and so on. So wanting to push the boost a bit higher. But there is a limit at 1.1 bar, which to me seems like its coded into the DI-APC ECU itself. Now, i can assure you, there is no Vacuum pipes going through the firewall. (Other than the one i have manually installed for a Boost gauge). And there are no sensors inside the car. This has also been noted on 92 cars in the US. 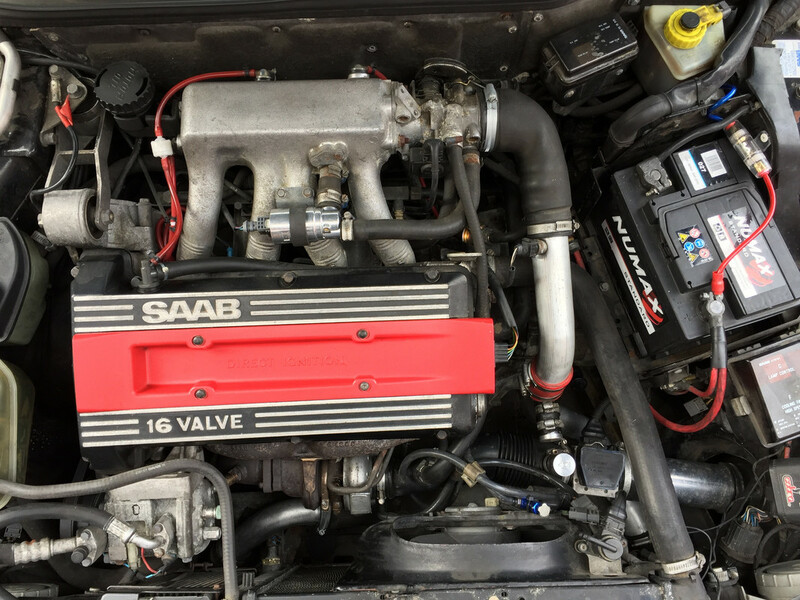 See the Saablink forum above. Im just trying to figure out how its working out pressure. Since clearly it can do it very quickly and accurately time after time. If there is no way over this, then there is only one way forward. And thats convert it to T5. It couldnt possibly be knocking, or anytjing to do with the knock sensor? My point above is that it is completely irrelevant how it works out boost pressure. Anything you do to make it think otherwise will screw up the mapping. Ignore my mention above about fuelling as you could affect the DI/APC without affecting LH (I was half-asleep when I wrote that) but you do want the ignition timing to be somewhere near the mark. I had forgotten you had replaced the turbo so you might as well go the whole hog and upgrade to Trionic so you can map it properly. Do fit a proper BPC valve, though. With the bleed valve it is like strapping a few solid-fuel rockets to the starship Enterprise to get a bit more go. Could you read the Carlsson and standard ECUs and compared for differences? I suppose you could, if you knew how. Those ECU's / ROM are very old now and who knows what they were compiled in. I actually still have an old BBC Micro in my workshop with an EPROM reader / writer. So i could have a go. It just seems alot of effort to get any BHP from these old DI-APC cars. I really need to research the T5 upgrade, but my brain is not what it used to be with my disability and all the drugs i take now. I know there is that young chap in the Projects section that upgraded his flat front Carly to T5 and did a fairly comprehensive write up. So i just need to study that. That thread will probably help you too. You might remember I'm rebuilding a flat front Carlsson and have a 2.3 T car as a donor. Well I got a 2.3 Carlsson APC that the owner thinks had been Abbott tuned and thought it ran at 1.5bar boost. Today I hooked up a boost gauge and it has 5psi dropping to 4 psi on base boost so that’s a little low. With APC connected I did see it hit 16psi twice (felt good) but falls back very fast to nearer 10 but it has old fuel in it. But that is bang on the fuel cut so maybe my ECU has had the fuel cut lifted or removed? If I get chance later in the week will lift base boost to 7psi see what happens. Unfortunately with a T25 turbo you will see boost falling back as you get over 4500rpm. By 6000rpm they only put out 0.8 bar. This is why we fitted a TD04-15T from a 9000 Aero. They will hold 1.5 bar to 6000. You wouldn't attempt to decompile or disassemble them. Rather do a binary comparison. Let me guess, that would be the easy bit? I do think you've now reached the limit of easy upgrades with DI/APC, and to decode and re coded with higher fuel cut will be harder (research+programming) than to convert to T5, which has far more potential. And I still maintain I can do T5 the easy way. With a little bit of wiring loom and time, easy peasy! Post subject: Re: 92 9000T DI/APC. Ignition cut removal. How ?. Just changed the title, as yesterday i realised its an Ignition cut. If you hit the boost limit, the rev counter just drops dead for a second until it cuts back in and you get some big exhaust pops when it cuts back in. Set it on 0.9 bar now, and it doesnt seem to spike anymore. Guess its got to stay like this until i man up and T5 it !. T5 it is the answer, but, if the ECU on DI/APC cuts the DI when boost is higher than specified, could that be bypassed to allow higher boost?